It’s official - turkey season has begun... Turkey Rhubarb season, that is. We’ve been keeping ourselves super busy chasing this pesky weed all over Lennox. Whilst Turkey Rhubarb is a perennial weed up here, each spring it tries to take further hold of our landscape by sprouting from underground tubers and popping up new seedlings. The battle with Turkey Rhubarb is most challenging on our Seven Mile Beach dunes sites. This is where it’s really trying to ensconce itself. Take a closer at our dunes next time you’re on the beach and you might be able to spot it. 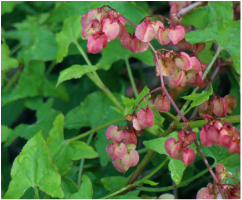 Native to southern Africa, it can be identified by its arrow shaped leaves, papery red seeds and its rambling nature. ﻿﻿We’re so concerned about Turkey Rhubarb we’ve decided to award it the title of ‘number 1 worst weed in Lennox’. It earns this title for a couple of reasons. Firstly it’s an aggressive scrambler, capable of quickly smothering native vegetation. And secondly, it’s super hard to control. It produces prolific seeds which need to be removed and bagged before they are dispersed by the wind. And it has dirty big underground tubers which need to be carefully dug out, sometimes from unforeseen depths. If a tuber is left in the ground, the plant will re-sprout. 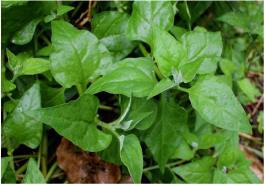 Speaking of edible plants there’s another species of edible plant which can easily be confused with Turkey Rhubarb - our Native Spinach. Native Spinach also grows on the dunes at Seven Mile - but not so rampantly. Native spinach can be distinguished from Turkey Rhubarb by its rhombic shape leaf and non-climbing nature. You can eat Native Spinach as you would normal spinach, however it needs to be blanched in boiling water first. It has relatively high oxalate levels and blanching it reduces these. We leave Native Spinach alone at our Landcare sites, but it could be a handy plant to have in your garden. Hope you’re going off to find yourself some greens to eat now! If you’re free on a wednesday morning this month come and join us for the turkey season. And if you’re inspired to forage for food, please make sure you know your plants well and do your own research first.